Timberland started out as a maker of tough-as-nails construction gear. Its target demographic of blue-collar workers adored the brand’s boots for their sturdiness, water-resistance and ability to keep their feet warm in the harshest weather. Then something peculiar started happening in the early ’90s. Reports began filtering into Timberland’s New England headquarters that the rappers in the Big Apple, and their fans, were buying Timberland’s six-inch work boots by the dozens even though the brand did not have any store presence there. These denizens of New York would make the long trip to the towns of New England just to purchase a pair of Timberland boots. It was the ultimate mark of street cred, a pilgrimage of sorts. Legend has it that the rise of Timberland’s popularity in New York was due to the hustlers and peddlers on the streets who had to walk all night and therefore, needed the best possible footwear to keep them warm and dry. The boots also protected them from the urban elements that polluted the streets. From broken glass to barbed wire, the boots stood strong. Noticing this, the city’s rappers followed suit. Interestingly enough, the management of Timberland tried to disassociate itself from its urban popularity. The then-CEO Jeffrey Swartz said to The New York Times in an interview that “if you want to buy us and you are not our target customer, we don’t have a point of distribution that speaks to your lifestyle”. However, after realising that this still didn’t deter its fans, Timberland embraced its new cultural role. Decades on, Timberland’s products are still crafted with its original tenets – craftsmanship, sturdiness and reliability – in mind. From hip hop to hiking, Timberland straddles a multitude of worlds that have fallen in love with its iconic six-inch boots and array of fashionable technical gear. This was the premise of AUGUSTMAN’s exclusive event with Timberland, which was an introduction to its latest winter gear. Held at the brand’s boutique at Raffles City Shopping Centre, the event featured a brief history of the New England apparel maker followed by the various technologies that can be found in Timberland clothing. But everyone was eager to try their hands, well, feet, at the latest range of Timberland’s six-inch boots, which have been made lighter yet still feature its waterproof technology. Many of them walked away carrying bags of Timberland’s products, thanks to a special discount extended to guests of the event. Guests were also well-lubricated with glasses of Auchentoshan whisky, which kept spirits high and the conversations flowing. Find out what happened in the event in our video below and keep up to date with AUGUSTMAN’s events by signing up for our newsletter. No spam, only the stuff that we like, which means you probably will too. 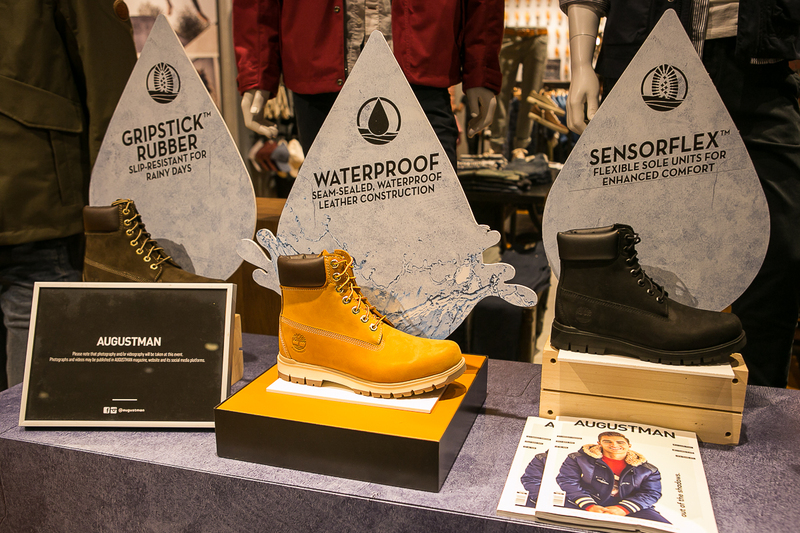 The Timberland flagship store is at 01-30 Raffles City Shopping Centre and opens from 10am to 10pm.